Digitalization and Industry 4.0 are enablers of fundamental business innovation and disruption. By closely interlinking development processes, logistics and production with Industry 4.0 technologies, iDev40 achieves a disruptive step towards speedup in time to market. By developing and implementing a digitalization strategy for the European electronic components and systems industry a “breakthrough change” is initialized. Integrated Development 4.0 leads the digital transformation of singular processes towards an integrated digital value chain based on the “digital twin” concept. Development, planning and manufacturing will benefit from the “digital twin” concept in terms of highly digitized virtual processes along the whole product lifecycle. Addressing European Policies for 2020 and beyond iDev40 aims to offer solutions to some difficult societal and organizational challenges, like innovate technologies to master the increasing complexity of development and manufacturing of ECS “made in Europe” regarding digitalization approaches and high quality knowledge. Strengthen European competitiveness through interdigitated development and production. Due to the creation of skilled jobs specific areas of logistics, products and processes are virtualized. The collaboration of key European ECS actors in terms of digitalization is strengthened. “Knowledge workers” in manufacturing as well as development and assessment of global value chains are supported by smarter machines (AI). iDev40 covers the whole value chain to provide sustainable, digital and industrial solutions for integrated development and production. The aim is to implement data and knowledge management systems that intelligently manage data in a large heterogeneous environment, drive security concepts for a need-to-know data management, provide solutions for data driven advanced analytics of largely heterogeneous databases and adopt artificial intelligence and deep learning algorithms in order to semi-automatically enrich contents and extract facts from unstructured contents. To enable the virtualization of ECS Value chains a knowledge based development in digitalized production companies is integrated, to achieve the production of individualized products. In this context many core areas like virtual manufacturing, experiment control, remote development etc. are addressed. The aim is to map out a common company wide data formalization, sharing and collaboration strategy for product development, production and maintenance through the whole product lifecycle in terms of SSoT. Based on the resulting database a “Digital Twin” is developed. With a “Digital Twin” complex processes in a learning environment are better handled. Furthermore, with this concept productivity, the use of resources and quality are improved. In the domain of industry 4.0 also social skills in terms of digitalization are required. The right skillset to cope with complex digitized systems to achieve high quality products, short development and lead times at reasonable costs is more and more a precondition for employees. Due to a knowledge driven and an integrated development of workforce the focus lays on the education of employees, the design of production systems and value chains for an efficient knowledge base and seamless collaboration across borders. 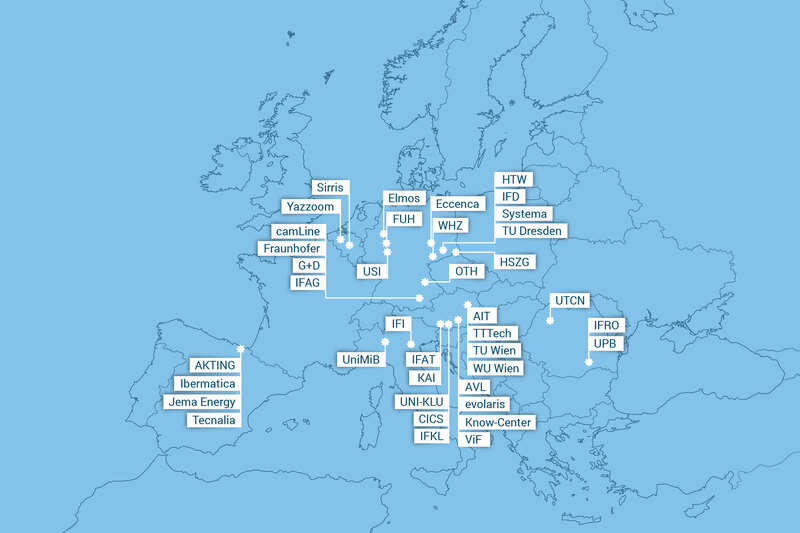 iDev40 is a pan-European effort within the ECS industry. The international team consists of leading industry partners, small- and medium sized companies, research institutes and well established universities.